A modern take on the classic martini, this gin cocktail is like the first spring blooms. They fill your home with light, warmth and the promise of lovely days to come. 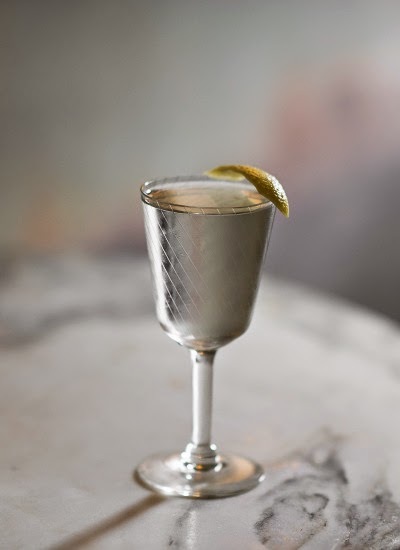 Combine gin, Martini Bianco, apricot eau de vie and orange bitters to a mixing glass. Add ice and stir to chill. Pour cocktail into coupe glass and garnish with an orange peel. If you don't store your coupe glasses in the freezer, you can quickly chill your glasses by dropping a few ice cubes into the glass along with some cold water. This cocktail reminded me of one particularly memorable night we dashed all over San Francisco looking for apricot brandy. We finally procured a questionable looking bottle of the stuff and John mixed it into a Pendennis Club, but we were very quickly on to drinking other things. We still have that terrible bottle of apricot brandy on our liquor shelf as a reminder to always be prepared–and buy the good stuff–Orchard Apricot is my recommendation. Cheers!